Could it be any more soup season? Anyone catch that Chandler from Friends reference? ...But really! 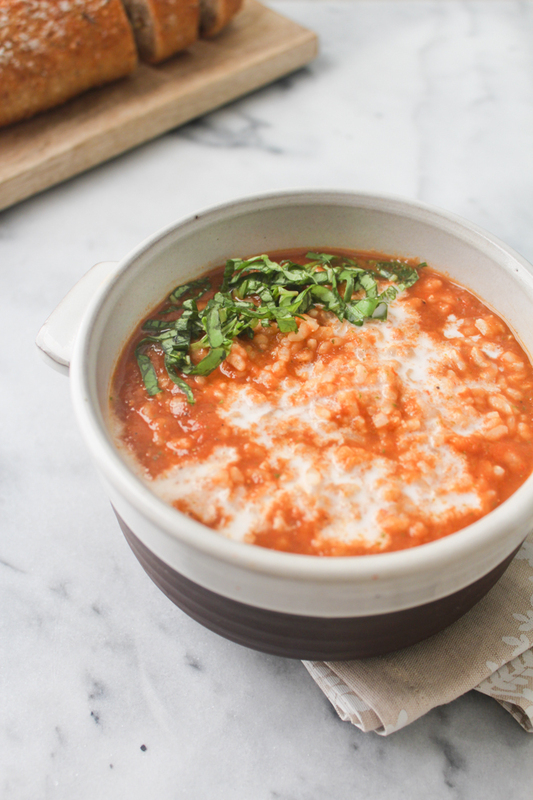 Soup is such a staple this time of year and this one has become one of my favorite easy lunches. Working in the Financial District of San Francisco, there are so many tempting lunch options just steps away from my office like made-to-order salads and fresh veggie sandwiches. Although it's fun to eat out every so often, it's not something I feel good about spending money on every day. On the flip side, the last thing I want to do at the end of my work day after already preparing dinner is make my lunch for the next day. That's where this soup comes in. Ever since it has cooled off, I've loved making big batches of soup on Sundays and then enjoying them for lunch throughout the week. Minimal time spent cooking on the weekend and no cooking during the week has made it super easy to stick with bringing my own healthy lunches with me to work. 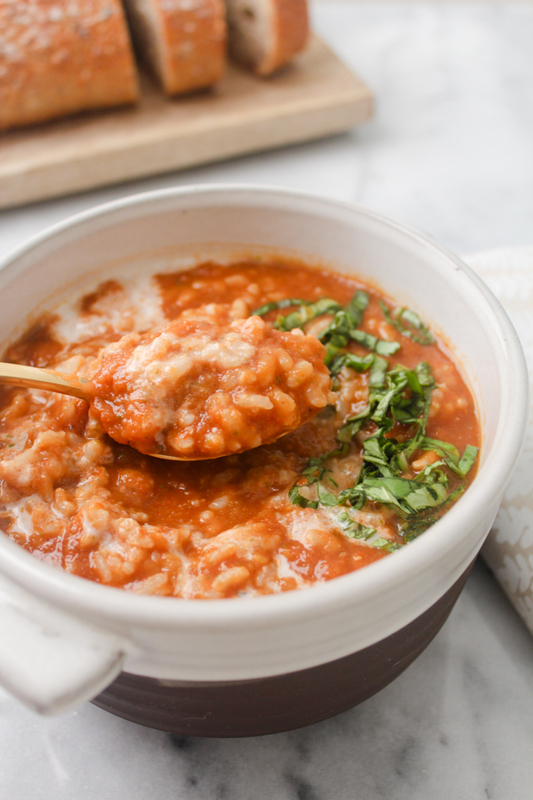 This tomato, basil, and rice soup has become one of my favorites and it's actually so ridiculously easy that even if you don't make it on the weekend, making it during the week can be done with minimal effort. Meaning that, if one of your New Year's resolutions was to start bringing your lunch with you to work, this fail-proof recipe is going to really come in handy. 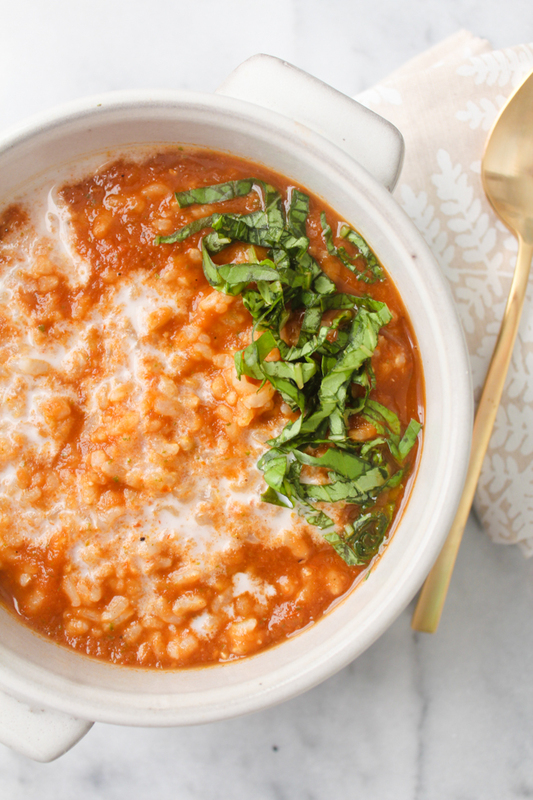 I was inspired to create this recipe as a remake of a classic I loved to eat when I was a kid - Campbell's Old Fashioned Tomato Rice Soup. Did anyone else used to love that as well? It was so good but full of preservatives and sodium, and never made me feel that great. That's why I created my own version with fresh basil, brown rice, and coconut milk in place of cream and it's so much more delicious. - Blend or process all ingredients besides the rice in a blender or food processor until smooth. - Transfer to a pot and season with salt and pepper. Heat on medium-high until simmering. 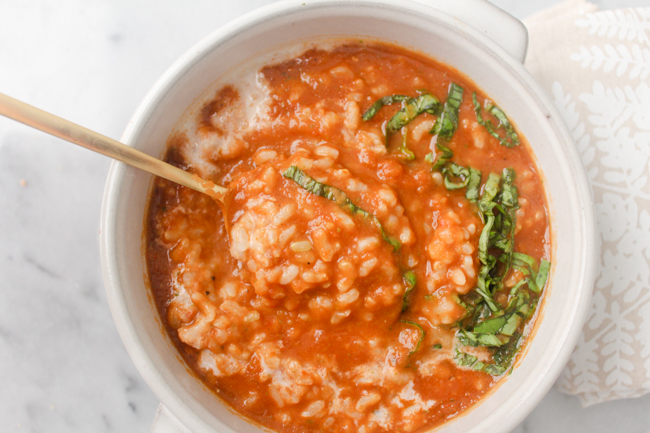 - Divide rice between two bowls pouring soup over the top, stir to mix. mmmmm yums! this looks so tasty!! Thanks, Trang! I really appreciate it! Love your blog as well, what beautiful images! My family and I had this for dinner last night. This meal whipped up in no time and was incredibly delicious!! Full of flavor and creaminess. My blender has a soup option that heats food up piping hot as it purees so there was no need to transfer to a pot to heat it up - so love when meals are this easy. 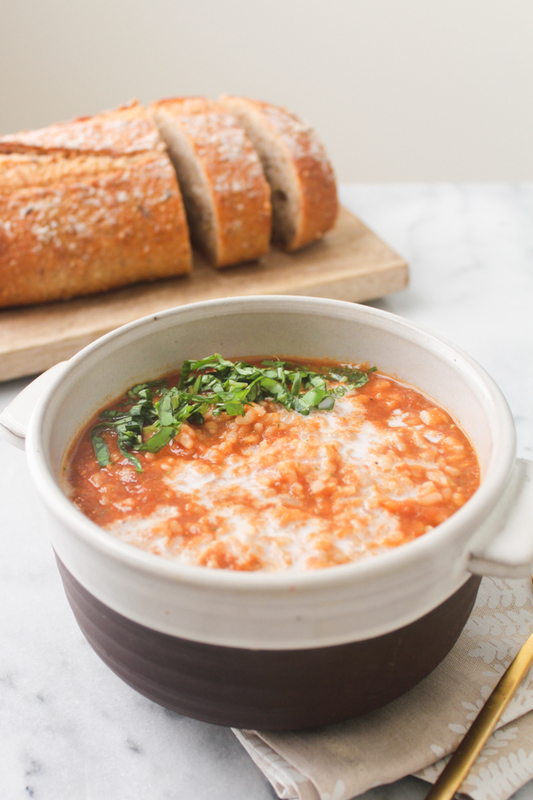 Served with additional warm, crusty garlic bread because one can never have too much bread ;) This is one soup that will be made many times over. My son has already requested next time to omit the rice and have vegan grilled cheese sandwiches to accompany the soup. Thanks for a hearty, flavorful and easy meal! Just delicious. This recipe calls for coconut milk from the can, correct? Hi! I'd love to pin this recipe but I can't figure out how to do it! If I wanted to use coconut cream instead of coconut milk (because I already have many cans of the cream) how would I adjust this recipe?